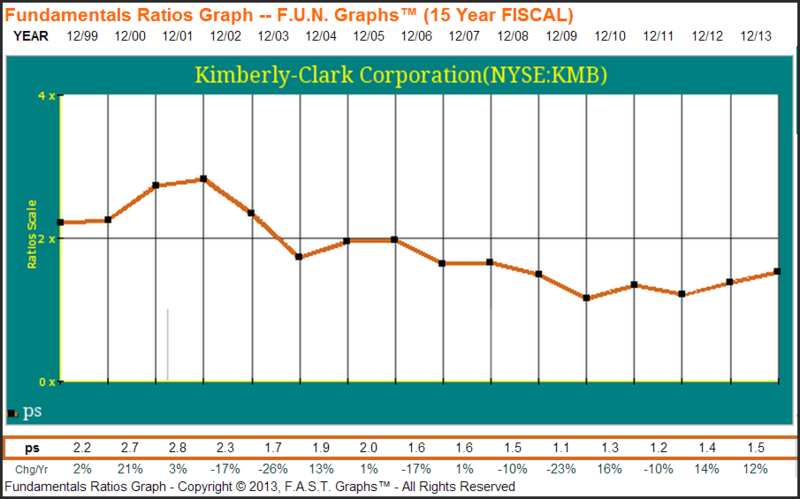 Kimberly-Clark is a storied company and often a reasonable investment opportunity based on ordinary metrics. Frequently investors view these few basic metrics and come to an investment decision. With this article we would like to highlight additional fundamental data on this specific company that that might be useful. If you’ve ever had a baby, a cold or used a restroom (not necessarily in that order) you likely have a pretty good idea what Kimberly-Clark (KMB) does. Headquartered in Dallas, Texas, this consumer care company sells products in more than 175 countries with 5 billion dollar brands including: Huggies, Kotex, Scott, Pull-Ups and Kleenex. With a history dating back over 140 years, the company now employs 58,000 people worldwide. Ordinarily we might go through an analysis using the most recognizable items of the company – such as the current P/E, “normal P/E”, earnings growth and dividend yield along with the company’s estimated future possibilities. Further, we often like to point out the folly of viewing price only graphs and instead emphasize the relationship between both price and business results. However, for this article we wanted to take a slightly different view of the company by focusing on a variety of additional fundamental metrics. To accomplish this, we thought it might be “FUN” – pardon the pun – to use the Fundamental Underlying Numbers (FUN) Graphs as provided by F.A.S.T. Graphs™. To begin, let’s look at the difference between viewing metrics on the company level and on a per share basis. For instance, below we have included a graph showing total revenue (rev) for the company over the past decade and a half. We can see that sales moved from about $13 billion in 1999 to today’s number closer to $21 billion. Expressed differently, the company was able to grow total sales by about 3.5% a year – ahead of the inflation rate during this time period, but only by about 1% annually. So to begin you might not think that the company has been altogether impressive – consistent, but not the fastest of growers. Yet contrast this graph in comparison to the revenue per share graph below – it’s the same fundamental data item, just a different way to measure it. In this case we can see that revenue per share (revps) went from about $24 to $55 – a 6% yearly compound gain. Said in another way, total revenue for the company grew at 3.5% per annum while revenue per share grew by 6%. 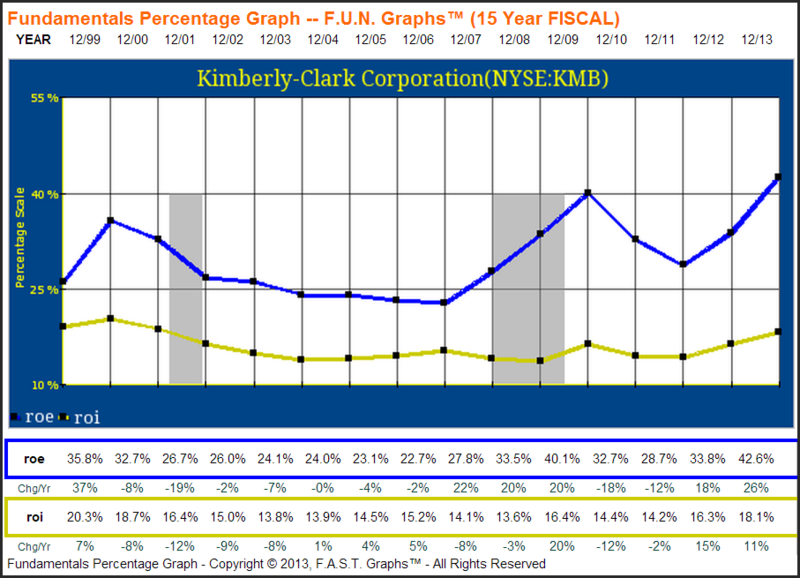 Kimberly-Clark goes from a company growing with inflation to a company in the middle of the growth spectrum pack. Of course the underlying reasoning behind this discrepancy relates to the number of common shares outstanding. 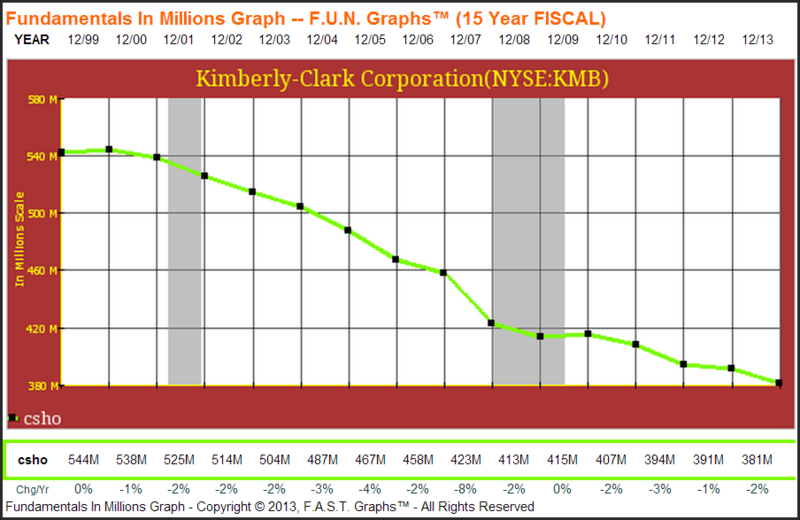 Before presenting the graph below, we already know that Kimberly-Clark has an effective share repurchase program. By viewing the common shares outstanding (csho) this inference can be confirmed. 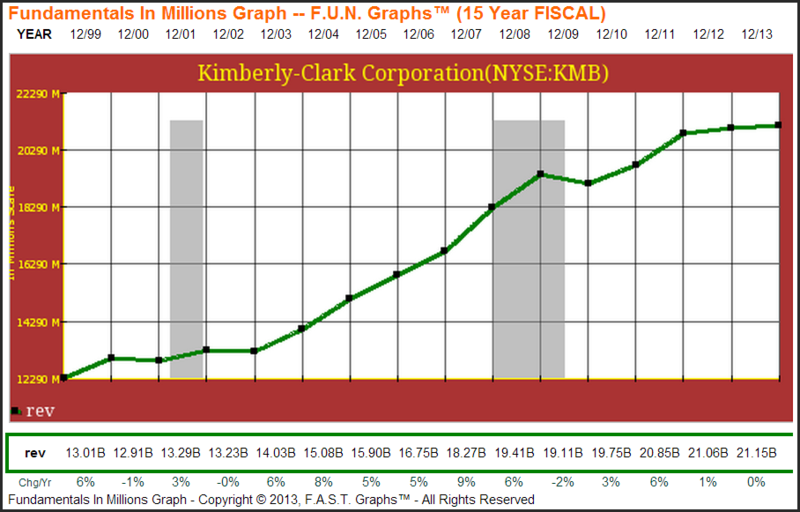 In 1999 Kimberly-Clark had 544 million shares outstanding as compared to just 381 million today. That’s a 2.5% yearly reduction and directly explains why revenue per share growth can consistently outpace total sales growth. In finding this information, one’s analysis may be positively influenced. For instance, last year Kimberly-Clark sold about half of its products in North America and the other half around the rest of the world. Looking forward, perhaps your analysis of the company were to suggest that North American sales would remain flat while revenue in the emerging and developing markets grew at say 7% (not too dissimilar from recent history). As such, you might imagine that the company grows sales at 3.5% per year. Yet keep in mind, as we just saw, that this could easily translate to 6% revenue per share growth. Now this is just a single demonstration, but it largely holds for any metric – such as earnings or dividends. Even if a company, as a whole, can only grow by a small margin there are factors at play that differentiate the prospects of company growth versus per share growth. In the very long-term these are likely to converge, but for sustained periods per share growth can easily outpace total company growth. This illustration simply demonstrates that 4% growth could actually mean 6% or 7% – even without cost cutting or improved margins. A second example of looking beyond the normal metrics comes in the form of dividends. Ordinarily one might note the dividend yield and move on to the next metric – without considering some underlying tenets. For instance, knowing that Kimberly-Clark pays a dividend is a start. 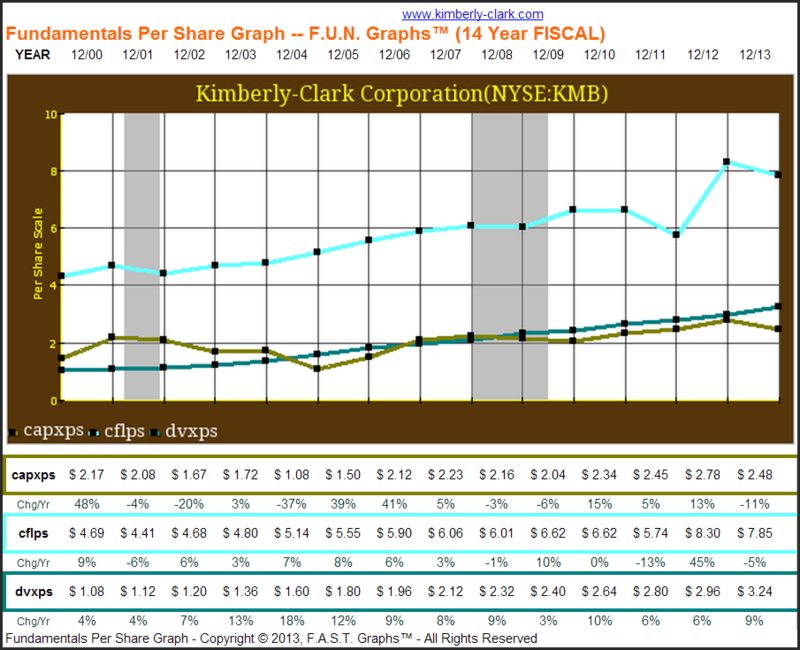 Knowing that Kimberly-Clark has not only paid but also increased its dividend for 42 consecutive years is better. Yet perhaps most important is whether or not this payment is sustainable. A short-cut would be to check out the company’s earnings and find a payout ratio ranging from 50% to 56% in the last few years. Conceivably the best option is to compare the cash inflows to the major outflows. This is precisely what we have done in the graph below. In this graph we see cash flow per share (cflps) as the top, light blue line in comparison to both capital expenditures per share (capxps) and dividends paid per share (dvxps). Note that in no year since the turn of the century has the combination of dividends paid and capital expenditures exceeded cash flow. We suppose that’s somewhat recognizable considering our earlier presentation of the company’s strong and consistent buyback program. Nonetheless, it’s reassuring to see that the company you are invested in or are considering partnering with has enough inflows to cover its outflows. Moving forward you can keep this in mind – if you assume dividends will continue to increase, you might also want to be confident that cash flows will continue to cover these obligations. In other words, you should have an expectation about the company’s returns and whether or not they will persist moving forward. 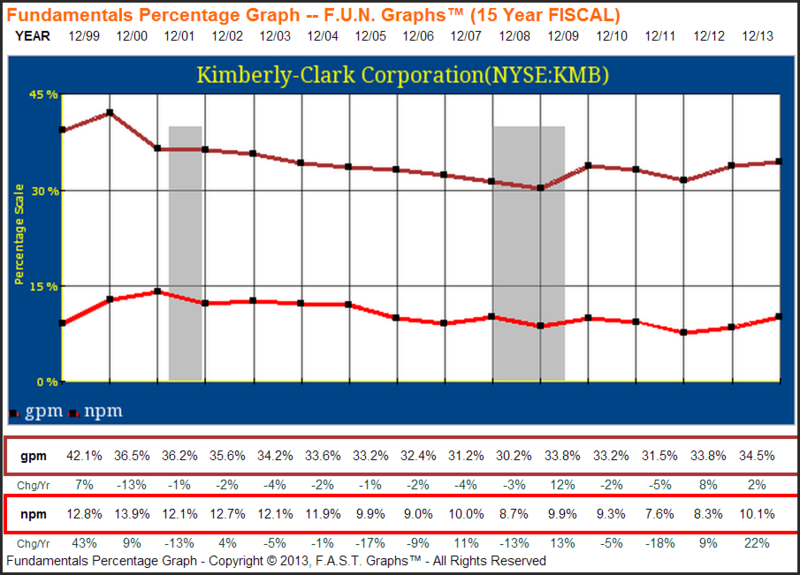 For instance, below is Kimberly-Clark’s return on equity (roe) and return on invested capital (roi). We can see that while the ratios have been somewhat volatile, they have historically been quite reasonable. Return on equity has regularly stayed above 20% – sometimes much higher – and return on invested capital has hovered around the 15% mark. Likewise, the company’s margins have been largely consistent. Gross profit margin (gpm) has been in the low 30% range while net profit margin (npm) has inched up near 10%. Now it is true that there is a somewhat downward trend – possibly due to generic competitors, pricing wars, discounting options or a combination of the three – but for the most part the healthy margins have remained intact. Using history as one’s guide, your investment thesis shouldn’t simply revolve around whether or not the company has a reasonable dividend yield but more aptly as to whether you believe the current margins and returns can be sustained; thereby increasing the likelihood of increased cash flow and an ample amount of inflow coverage. Finally, there are far too many additional metrics one might view than could be included in a single article, but we would like to end on the concept of valuation. Ordinarily you might look at the P/E ratio primarily – as it’s often the most readily available. For instance, F.A.S.T. Graphs provides 5 earnings mnemonics – which correspondingly have 5 different P/E ratios. Each one can be useful in their own way, but really these metrics are often more similar than they are different. For instance, below we have included a graph looking at price to basic earnings (peb), price to diluted earnings (ped) along with price to operating earnings (peo). Sure they’re not precisely the same, but by-and-large they move in tandem. To supplement this view, a potential investor might look to other valuation metrics that aren’t as apt to be nearly as correlated. 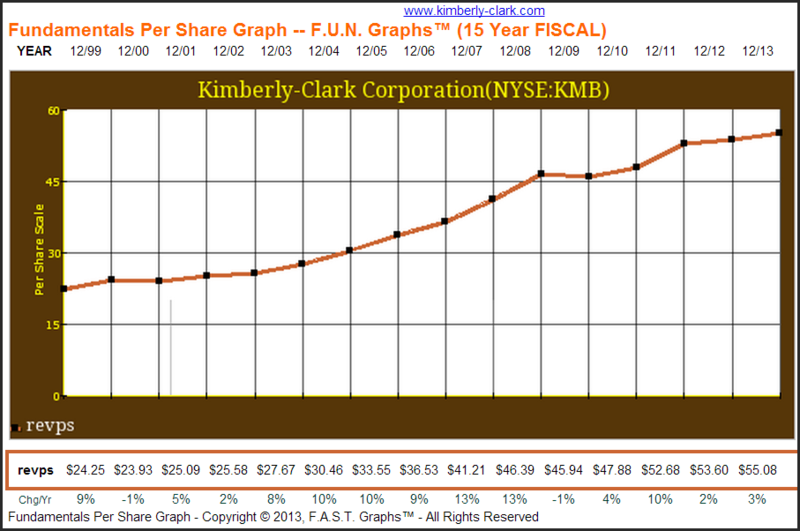 For example, below we have included the price to book (pb) ratio for Kimberly-Clark. You can see that it had ranged from 3.5 to 7.4, and last year stood near the upper end of that range – at 6.6. 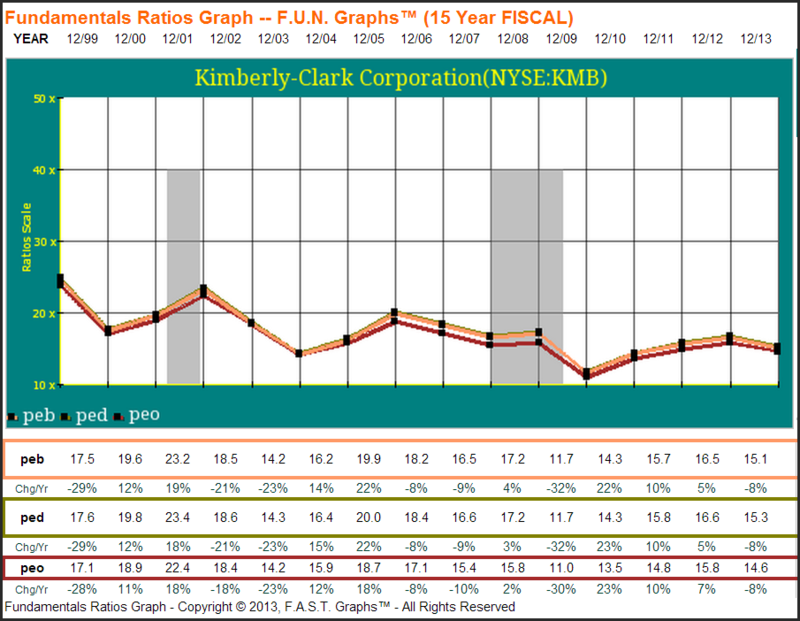 Or you might also be inclined to view Kimberly-Clark’s price to sales (ps) ratio. We can see that this ratio ranged from 1.1 to 2.8, has been trending downward in the last few years and presently sits at about the same level as it did prior to the recession. Overall we believe Kimberly-Clark is a storied and consistent company. Ordinarily we might be inclined to view the company primarily through the lens of the Earnings and Price Correlated graph in F.A.S.T. Graphs. However, for this article we thought it might be “FUN” to look at a variety of different, less observable, fundamental metrics. At the end of the day we come to a similar conclusion as we would have by viewing the F.A.S.T. 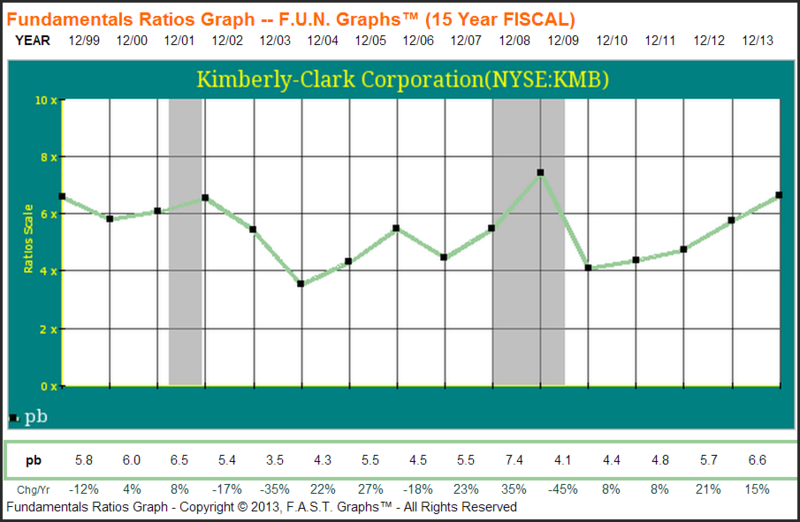 Graphs you have become accustomed to – Kimberly-Clark has the opportunity to grow per share metrics in the mid-single digit range and continue to increase its well covered dividend, yet shares are trading at the higher end of the valuation range than they might normally. Further, you still have to make predictions about the company’s future. But the important part is that coming to the analysis from a different angle allows you to more easily illuminate the underlying drivers of performance – and perhaps it will even make the process a bit more enjoyable. As always, we recommend that the reader conduct his or her own thorough due diligence. Disclosure: Long KMB at the time of writing. This entry was posted in FAST Graphs At-A-Glance and tagged KMB. Bookmark the permalink.